Forgot the password of Outlook email account? 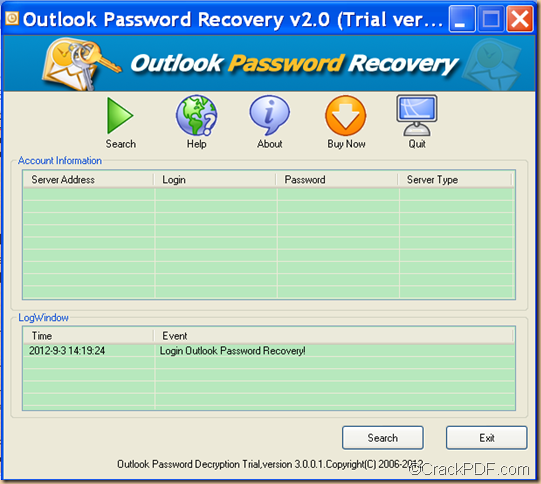 CrackPDF Outlook Password Recovery can help you easily recover Microsoft Outlook password for email accounts. Outlook is a good email, contact and calendar management tool. Due to its versatility and ease of use, Microsoft Outlook has become a popular email client for both individual and business accounts. Outlook allows you to add and access an unlimited amount of POP/IMAP/HTTP accounts, but what if you forget the passwords of accounts you have setup up in Outlook? 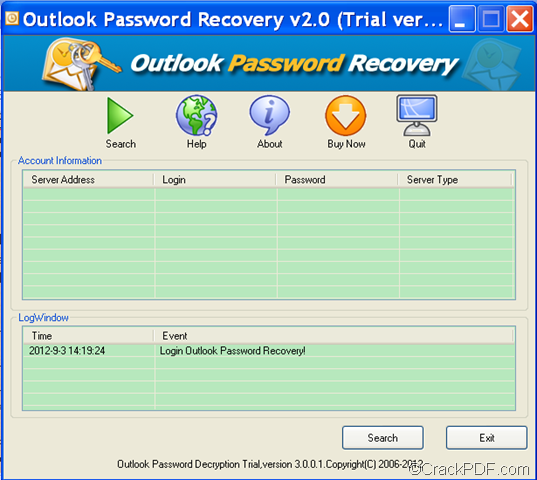 If you have forgotten the Outlook password, then take a whirl of CrackPDF Outlook Password Recovery. It is a nifty app which enables you to instantly recover Outlook password for almost all versions of Microsoft Outlook, such as Outlook 1997, 2000, 2003, 2007, and 2010. Please download CrackPDF Outlook Password Recovery, then double click the installer and follow the setup wizard to install it. After the successful installation, it will run. When you open the application, you can see the interface as shown below. Please click the Search button to start to recover passwords for the Outlook email accounts. As you can see from the above snapshot, there are two “Search” buttons in the interface of the application. You can click either of them to retrieve the Outlook password. Then, the application will start to find back the Outlook passwords. A few minutes later, you will see the server addresses login email names, login email passwords and the server type in the “Account Information” table. You can also know the start time and finish time of the process in the “LogWindow” table. Note: The trial version can only be used for 20 times. What’s more, if you use the trial version to recover Outlook passwords, you cannot see the full passwords If you want to see the full passwords, please buy CrackPDF Outlook Password Recovery. If you want to recover Outlook password with CrackPDF Outlook Password Recovery, you can click the following button to download it. Cannot send and receive emails through Microsoft Office Outlook because forgetting the passwords to the Outlook email account? This happens a lot especially after you reinstall your computer OS, for you have made Outlook automatically remember the password for your convenience. If you forgot the password of your Outlook email account, all your email messages, appointment list and contacts will be completely lost. Firstly, you can try to contact the ISP or email service provider and ask them to reset the password for you. In fact, Outlook acts as an intermediary and passes the password you set to your email server and it does not set any passwords . 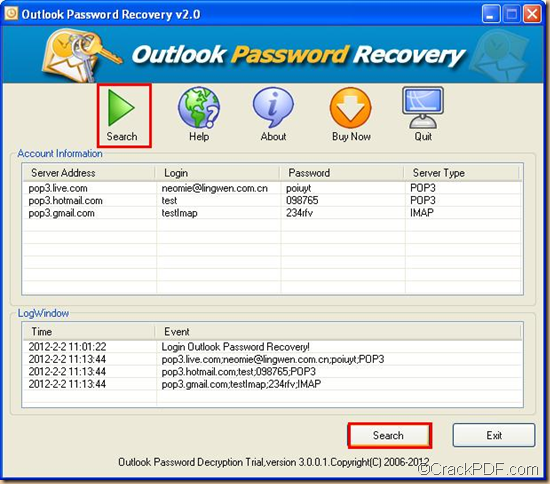 Secondly, when the ISP or email service provider is unable to help you regain or revive the forgotten password, you can try to use a Outlook password recovery application—CrackPDF Outlook Password Recovery. CrackPDF Outlook Password Recovery is an easy-to-use application which can effectively and quickly recover forgotten or lost Outlook passwords for Microsoft Outlook email accounts. No matter how long and complicated the passwords are, it can instantly recover all the passwords. It is compatible with Windows 7, Vista, XP, 2000, Server 2008(R2), Server 2003(R2) and supports all versions of Microsoft Outlook such as Outlook 1997, 2000, 2003, 2007, and 2010. It can not only retrieve password of Outlook, but also can recover the account name and server name of Outlook. It is extremely easy to use. The only thing you need to do is to click just one button-Search. 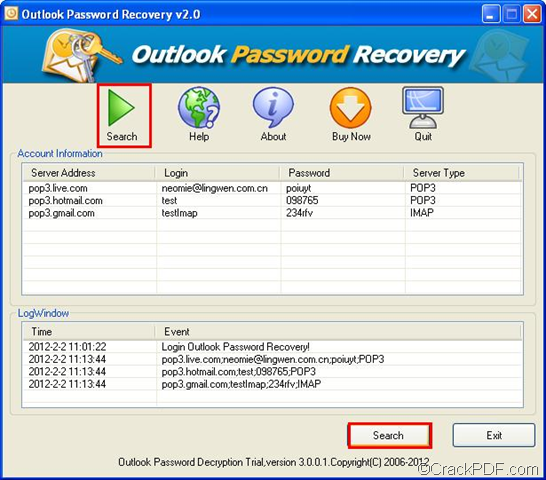 Then, CrackPDF Outlook Password Recovery will recover the forgotten or lost Outlook email passwords in a wink. I hope these small tips and tricks will help you when you need to recover forgotten Outlook password. For your reference: if you want to know more about CrackPDF Outlook Password Recovery, please contact support@crackpdf.com.